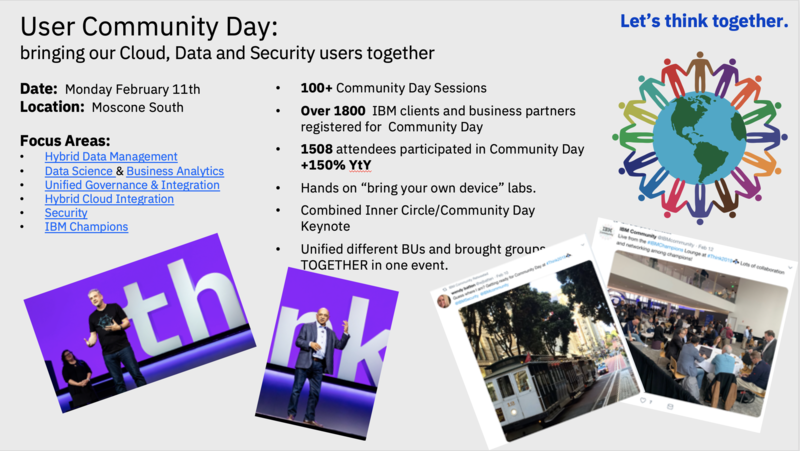 Thank you for attending Community Day at IBM Think 2019! Community Day (#CommunityDay19)! We hope you enjoyed your chance to meet the folks behind the solutions you rely on, as well as the other members of the IBM hybrid cloud and security user communities, and were able to check some of the more than 100 sessions, network with your fellow community members, share knowledge. Maybe you even met some of the community site managers and told us how we could make the communities better, or the improve the Community Day experience for next year. Yes, next year. Your community team is already planning Community Day at IBM Think 2020, which we're targeting for May, 2020. Why May? Well, because we listened to you, and we heard that you didn't like the cold and the rain, so the heck with that! As for your other suggestions, we'll be busy implementing them during our planning process; check out this page regularly to keep updated on what's going on! "How did it go? "; "How was attendance? "; "Which presentations were most popular? "; these are some of the questions folks have been asking us in the wake of community day. Being a visual bunch, we thought we'd put a slide together for you to provide some answers. Do you have more questions? Surf on over to one of the community sites and post it in a discussion thread, and we'll be happy to answer! No one can see 100+ presentations in 8 hours, so over the next few months we're going to ask our presenters to webcast their presentations for you, and make recordings of them available on our community sites. Want to know when the webcasts will happen, and when and where the recordings will be available? Click the button of the community you're interested in, check in at the events list regularly, and you'll find out!